Flir E6 is a compact thermal imaging camera that offers a great price to performance value. 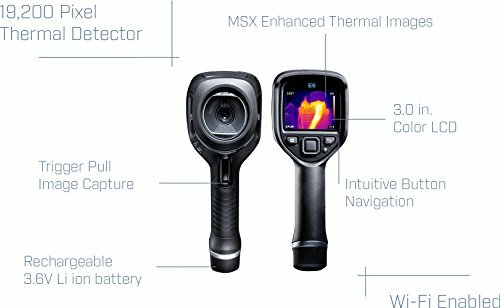 This device falls under Flir’s entry-level Ex-series range of infrared cameras that are based on exclusive Multi-Spectral Dynamic Imaging (MSX) technology. This is a feature that overlays all of the high-contrast lines from the actual camera images onto the IR image, making everything seem more detailed and clearer. Flir, the world leader in the design and manufacturing of thermal imaging cameras, has managed to include all the essential features in the E6 so that professionals can address their varying IR inspection needs, and that too in a budget. It is definitely one of the high quality and affordable thermal cameras on the market for everyday use. But whether you should buy it or not is based on exactly what features you need and the types of work you will be using it for. This FLIR E6 review will help you make a right decision. The E6 comes with 160X120 IR resolution. While it is definitely not the best in the market when compared to other high-end imaging cameras, it manages to produce satisfactory visuals. At least, it exceeds the minimum allowable RESNET resolution standard, which is important to home energy auditors. The E6 arrives with a built-in optical camera that allows you to take optical images and IR images simultaneously, with the angle and perspectives always being the same. This is certainly a feature worth paying for. Without this feature, you have to hold your regular camera right up next to your IR camera while taking pictures if you want to obtain exact angles. The E6 has eliminated this hassle by including the optical camera in the E6. As mentioned above, the E6 is based on FLIR’s MSX technology that offers an easier interpretation of visuals by displaying thermal details in real time. It makes everything in an image really “pop” which is great for preparing accurate inspection reports. 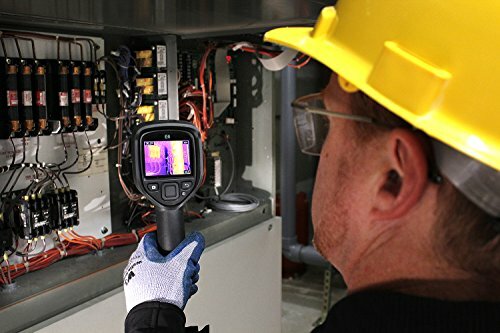 It instantly highlights potential problem areas and offers a great deal to professionals who need to capture high-quality thermal images every day for inspections. With this technology, FLIR has definitely managed to offer amazing visual quality at a lower price. The FLIR E6 has an MSX resolution of 320X240. The FLIR E6 is a handheld thermal imaging camera with a compact and ergonomic design which makes one-handed operation very easy. It has been designed while keeping portability in mind, which was definitely important considering the applications of the thermal camera. For example, when you are going to inspect houses, you will certainly want a device that can easily fit in your tool belt without being heavy. While it is lightweight (1.2lbs), it has a rugged construction and is made for use in harsh environments. I have dropped mine a number of times and I must say it is definitely a tough camera with amazing build quality. The E6 has an intuitive, user-friendly interface for measurements in MSX or thermal mode. The simple button navigation, on-screen settings, a focus-free lens, different measurement tools, several imaging modes and saved JPEGS make E6 very easy to operate, even with just the press of a single thumb. The E6 comes with 2 years warranty on parts and labor, 5 years warranty on the battery and 10 years warranty on the detector, which is the most important part of the entire camera. 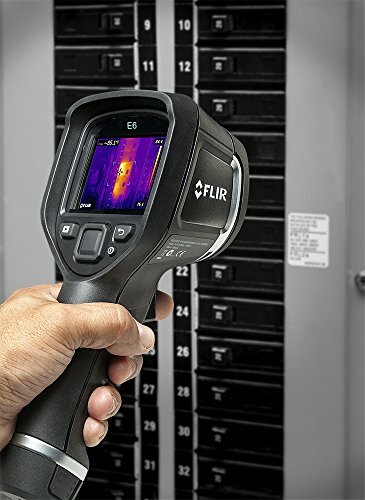 With FLIR E6 thermal imaging camera, professionals can easily identify electrical, mechanical, or construction issues for their inspection reports. The device quickly pays for itself because the failures and issues are easily identified before an expensive break down occurs. While it is mainly geared towards professionals, the hobbyists can also put it to use. However, the FLIR E6 price can set you back if you are a hobbyist. The E6 is most suited for professionals who are looking for a mid-level infrared camera for general inspections. At this price point and with such performance, this thermal imager really stands up to the expectations. For many people, resolution can be an important deciding factor. If you are also among those, then you may want to consider the FLIR E8.